Innovation, customer choice and reliable, easy operation at the lowest possible cost. There's a lot of talk these days about making it easy and cost effective for plug-in vehicle drivers to charge their cars. Ironically, much of the effort thus far to provide charging equipment and services have made it unnecessarily complex, expensive and confusing. Liberty PlugIns is dedicated to providing plug-in vehicle charging equipment and services that make it easy to charge, even when complex electricity pricing and electric load-control schemes are required. An EV charger is really just a glorified extension cord, and even if electricity prices are changing every hour, all the charger needs to do is get energy in the car at (or below) a price you're comfortable with. That's what we do, and we do it at the lowest possible cost. Liberty PlugIns is constantly reviewing emerging standards like OpenADR and, long-established standards like Payment Card Industry (PCI) standards to implement open, reliable and secure technical interfaces and operations for billing, reporting and advanced load management. 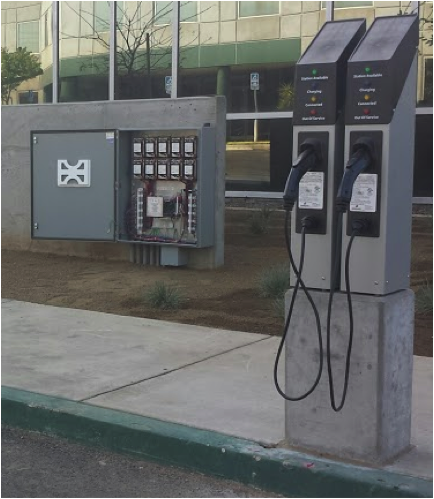 Liberty PlugIns is the first EV charging equipment and services company to provide hardware and network services supporting the first-ever participation of EV charging load in the California energy market. 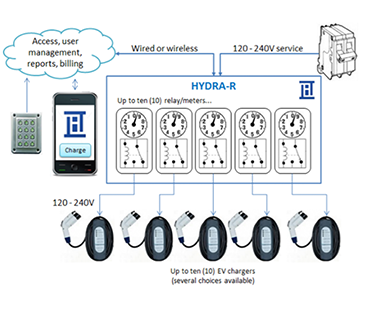 The HYDRA-R provides access control, metering, usage reporting and load management capabilities for low cost, non-networked electric vehicle chargers installed in shared parking areas, typically found in workplaces and multi-unit dwellings. The HYDRA-R uses up to ten (10) 120/240V, 40 Amp branch circuits (one for each EV charger), and one 120V, 15 Amp circuit for the internal data recording and communications unit. Each of the ten branch circuits are connected to its own dedicated relay-meter module (RMM) inside the enclosure. Each RMM provides power to one EV charger. The system uses up to two hard-wired numeric keypads to facilitate entry of access control numbers (“PIN” codes). As a supplement to the keypad(s), a Smartphone application or Web site may be used to activate EV charging. Meter and relay-control data and commands are transferred to and from the back-office via cellular or Ethernet-based communications. Demand response/load management programs can be implemented using simple SMTP messages or using an OpenADR Virtual Top Node.